The Dividist Papers: The unexamined meme is not worth propagating. The unexamined meme is not worth propagating. Welcome to our first "State of the Blog" post. Divided government is better government. Single party control of the executive and legislative branches of government always results in fiscally irresponsible government, bad governance, bad policy, and erodes our constitutional checks and balances. In a polarized political environment, it is feasible for a relatively small group of enlightened voters, acting in concert, to have an immediate and large impact that is far out of proportion to their numbers. 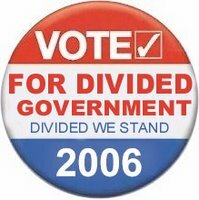 Voting for divided government could function as a organizing principle for like minded voters and have an immediate impact on 2006. As of the date of this post, traffic is holding in a consistent range of 20-30 viewers/day with an occasional spike higher. Low but not surprisingly so. Note to self: Do better. I have been gratified by some of the comments and e-mails I've received. Particularly those from some traditional media writers and authors I respect. "Reader and blogger MW offers an interesting solution to the problem of how libertarians can organize themselves for maximum political impact: Always vote for divided government. Always... That divided government keeps down spending is now the conventional wisdom. The idea of using that concept as the central organizing principle of a political movement ... it's far-fetched. OK, it's implausible. But it might stop anything much from ever getting done in Washington, D.C., which is a start..." from Divided We Stand" posted on Real Clear Politics by Ryan Sager - Author, The Elephant in the Room. "This article raises some fantastic points and questions, especially for the libertarian at heart... The author recommends letting the GOP lose in 2006, and thus have a divided legislature and executive branch. I like his points, and I have a few of my own.... what exactly would the Dems harm us with? They wouldn't get a damned thing passed into law, provided that (a) Bush can ever find his veto pen, and (b) he remembers that he's supposed to be a member of the "conservative" (snicker) ideology. ... Would Dems try to increase taxes? Sure. Would Bush veto the tax increases? Likely. Would a Dem House have the votes to override a veto? Nope. House Speaker Pelosi? Yeah, it's pretty scary. However, so is House Speaker Hastert right now... In short, I doubt that the Dems would get anything done. And as far as I'm concerned, based on what I'm seeing coming out of a "unified" government right now, I'd be pretty content with having nothing getting done.... Food for thought." In the end analysis, success for this blog will not be measured by traffic, but by whether the ideas discussed here have legs, and whether they have an impact on the political dialog. The "Divided Government" meme, is not original with this blog, but has been knocking around in articles and posts since before the '04 election. As an academic topic, its has been around even longer (see sidebar links). It clearly has some traction, but has not significantly emerged above the "noise level" [Compare "divided government" to the "cut and run" meme.] That said, there is a discernible and steady drumbeat of columnists, bloggers, and authors that drag the idea out on a regular basis, declare it good, then promptly put it back on the shelf. Well and good, but this idea is going to need to get much greater traction if it is to have an impact on the '06 elections. 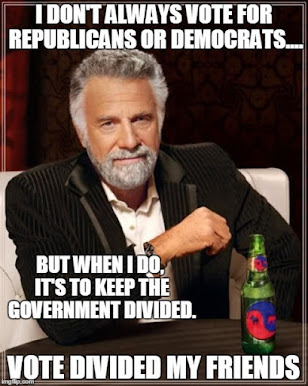 Moreover, the "Divided Government" meme may be just the cattle prod needed to get the electorate over the "all politics is local" hurdle (more on this subject in a future post). "Remember when some of us limited-government types were wondering when the Democrats would finally realize voters were fed up with the GOP’s massive federal budgets and start talking about fiscal discipline? Well, it’s finally happened — the talking, at least. House minority leader Nancy Pelosi just gave an interview to the Wall Street Journal (subscription required) in which she professed that Democrats would launch a campaign to reduce the number of budget earmarks if they won a House majority in November." Of course, the beauty of Divided Government, is that it really does not matter whether the Democrats are sincere in what they say. In fact, it does not matter what they (or the Republicans) say at all. It is not the Democrats that will control spending, it is not that the Republicans that will control spending, it is the fact that the government is not controlled by either that will control spending. It's time to retool. We have an organizing principle, we have an intellectual foundation, and we have evidence of support for the idea, from both the right and left. But we need much more visibility to get the message out. We need RSS feeds, blogrolls, haloscan, feedburner and advertising on the blog. We need logos, buttons, posters, bumper stickers, maybe even tee-shirts and pretty models to ratchet up promotion - and cripes we've got a lot of work to do. Whatever it takes. Most importantly, we are going to need allies to see if we can really get this thing off the ground in the next few months. Perhaps those allies are to be found in these posts culled over the last couple of years. Other Voices in support of Divided Government. "Ronald Bailey argues that those who favor small government should vote for gridlock this November. That is, they ought to vote for Democrats.... I'm inclined to agree. The health of the Republic is much better served by having as much power spread out as possible. Partisan politics and gridlock are an extra Constitutional separation of powers that helps to minimize government intrusions "mostly." Sadly, I think there's something to this theory that ideology-trumps-reality: If my guy isn't in the White House, then the economy must be a mess! ...But what if who's in power is less clear? Our government spends less when one party is in the White House and the other controls Congress. Is this another reason to root for divided government? ... In other words, while our political affiliations might shape how we see the economic conditions, for a good chunk of us there comes a point when we no longer stand by our man simply because we identify with the party in power. "Because I circumlocute so damned much, I want to make clear what I am advocating for and what I'm not. I'm not advocating for any particular course of action in Iraq in this post, even by implication - only for divided government in DC for the next two+ years. I want independents, moderates and conservatives who don't have the luxury of voting for a Hagel or a Lugar to vote for Democrats in November - or to stay home, at least. I want them to consider the strategic importance of divided government at this point." "How would gridlock benefit the country? First, Democrats and Republicans might stymie each others spending proposals, thus reducing the budget deficit. It's not a complete fantasy. During that blessed era of gridlock of the 1990s, total discretionary spending fell by more than 8 percent. We might also be spared disgusting exercises in political posturing on issues like gay marriage and flag-burning....So do your patriotic duty and vote for gridlock this fall. As for my first ever Democratic primary vote - I'm going cast my ballot for James Webb." " The much-hyped "government shut down" was a non-event for most Americans. We ought to do it more often, and for longer periods of time. Blake longs for divided government again, so here are my questions: Would it be better, for advancing the principles of conservative government, to have a Republican president and Democrats in control of one or both houses of Congress, or to have a Democrat president and Republicans in control of on or both houses of Congress?" "The only time Republicans have been anti-State with any vigor is when they've been out of power and confronted with Democratic initiatives. As I've said before, the Party out of power is always somewhat libertarian, if only to confound the Party in power; the Party in power is always anti-libertarian, because, hey, cool, power! ... For my part, I think divided government is our optimal state right now.. Short of an insurgent liberty-oriented 3rd Party (which I don't see happening) our only chance at limitation-through-competition is to have the Democrats square off against Republicans. Nothing motivates the Republicans to be good Republicans like Democrats threatening to be good Democrats." "I still don't believe it's possible that the Democrats will take over Congress, though they may take the Senate. However, wanting Democrats to win some control and wanting divided government in a lot of cases isn't about wanting one party to pass their agenda. It's about precisely the opposite of that. We've been shown in the Bush years the worst parts of one-party rule the likes of which this country hasn't been subject to since LBJ. We need some restoration of separation of powers here, and we need a Congress that alternates from being asleep at the wheel and hog farming." "I have never, not once in my life, voted for a Democrat, never. But this November I am calling for the Republicans to lose their majority in the House of Representatives, which means I will have to do the unthinkable, and vote for a Democrat. Of course I live in the most Republican district in the state of Tennessee, so I don't expect my Congresswoman to be defeated. But there are a lot of districts in other parts of the country that may be up for grabs... The only way that our government will ever reduce spending is if it is divided. Judicial appointments are too important to allow the Democrats to control the Senate and the Executive Branch, but we can and should sacrifice the House. All spending bills originate in the House of Representatives. The House is responsible for this mess.... I support gridlock, I love divided government, and I hate efficiency. The House GOP makes me sick and I hope they are soundly defeated this November." "This will probably piss off some of my Republican readers, but I hope that principled conservatives will understand why I'm writing this, even if they don't agree. I'm hoping the Republicans lose at least one house in Congress this November. It might not happen, of course, but this is a wish, not a prediction. Let's be honest. The Republicans have become too comfortable and too entrenched in the culture of power and corruption that permeates the capital. I've reluctantly concluded that the only hope of snapping them out of it is to hand them an electoral defeat. Look at the exploding federal budget and ask yourself what good they're doing. I've long been a fan of divided government, and I believe a few years of such a setup could be quite healthy (although Bush would have to learn how to use his veto pen.)" "So much for meaningful reform that tries to seriusly fix the system in general. Instead we get yet another demonstration about why one-party rule has proven to be a disaster in terms of authentic problem solving and biparitsan solutions..."
"I can't believe I am actually suggesting this, but we should not only vote for, but campaign for their Democratic opponents. We have to send these big spending, government expanding Republicans a message. We have to campaign for their defeat. I would rather have divided government and gridlock than a Republican President and a Republican Congress like the ones we have now." "...the Wash Post is one of the last places you'd expect to see a house editorial condemning government spending. But they do so today, attacking "big government conservatives" who spend spend spend while talking a good game about cuts cuts cuts. The Post does a real public service by highlighting the GOP's profligacy under George W. Bush: Of course, the short answer to the Post's rhetorical question is: Both. Though there's little question that government spending grows less under divided government." "Again, small government libertarians like myself, who held their nose and voted Republican in the last election, have been used....the Republican promise of smaller, less-intrusive government is getting harder and harder to believe. Especially when a more plausible plot line is unfolding every day: that the GOP has put aside the ideals of Reagan and Goldwater in order to pursue a political strategy based on big spending. ... It is not in the least bit comforting to have my suspicions confirmed by Cato, whose whole report is here. Bring back divided government! I will take Reagan-Democrat Congress or Clinton-Republican Congress over this any day." "Complaints about Republican profligacy have led the White House to promise to mend its ways. But Bush's latest budget combines accounting flim-flam with unenforceable promises. So how do we put Uncle Sam on a sounder fiscal basis? Vote Democratic. Democrats obviously are no pikers when it comes to spending. But the biggest impetus for higher spending is partisan uniformity, not partisan identity. Give either party complete control of government, and the Treasury vaults are quickly emptied. Neither Congress nor the President wants to tell the other no. Both are desperate to prove they can "govern" - which means creating new programs and spending more money. But share power between parties, and out of principle or malice they check each other. " Methinks we need to step up our game. We need to be more effective getting the message out, and we need to be more persuasive that the concept of Divided Government is not just an intellectual indulgence. This is the right way to vote, and the way to change the direction of our country. Well, that was harder than I thought it would be. But, I've got a little breathing room now, with a nice new column on the left, a blogroll, working feeds, some beginning advertising and a couple of other bells and whistles. It's a start. There are still some items that seem a little out of kilter here, but I'm tired of screwing around with the technology. This will have to do. Back to content. I got here by following up your post on dailykos. What you have to say here may be less important that what you say there because kos has more traffic. 'Fiscal conservative.' Government has been a WTF? problem for true conservatives for some time. If one believes, as apparently we both do, that one should *pay* for the things one wants, for whom does one vote? Lieberman as the man who brings home the pork is not the kind of politician that CT Democrats will support. I live in CT. I know lots of Democrats who dislike Joe Lieberman and that's not a new feeling. What I see in generic politicians the world over is the tendency to view government as a job rather than a call to service. They'll do anything a) to get elected, and b) to keep their jobs. In the USA, most of them are lawyers. I would make it a requirement of US law schools that every lawyer write a working program. If you've read the law, the law is one big chunk of spaghetti code. There's no shortage of bad law: 'Selling drugs within 1500' of a school' doubles the penalty, likewise assaulting a senior citizen. Like drug dealers travel with maps of the school districts on their laptops and muggers are attuned to the victims age. Here's a too-radical-for-you idea, eliminate politicans and voting in one stroke by randomly selecting governors (i. e., people who govern) from the general population to serve for a limited single term. This would eliminate campaigns, professional politicians and most lawyers, and voters choosing between self-selected sociopaths on the basis of which is the better liar. A random selection would focus government on the problems of real people since the government would consist of real people. Hard to implement, sure. But perhaps by petition a law could be enacted that required every elected offical to carry around in a book bag the general statutes covering their jurisdiction? And every agency head their rules and regulations? For sure this would simplify the IRS. Hope you don't mind that I don't "read and delete" your comment. Good stuff. I do occaisionally post excerpts from here into my kos "diary". In fact, my first post there outlined the same themes as this post. The flip side of the traffic, is the mountain of content. It's too easy to get washed away in the diary flow. But I have noticed some traffic from kos here, and I'm having some fun commenting over there. I also think it is important to have these ideas framed outside of the kos context, as everything there is painted purely left of center. In fact, just using the term "fiscal conservative" in my kos profile provoked some interesting (and negative) reaction. "The problem is bigger than the Republicans and focusing exclusively on the GOP will not solve it. The problem is inherent in the nature of the political process in Washington. Simply put, the seduction of power and its inevitable consequence of an overriding imperative to be reelected ultimately swamps all other considerations for the falible humans holding public office. The perception of incumbents is that: Reelection requires money that only special interests can provide; Reelection requires pandering to polls over principle; Reelection requires cultivating local loyalty by bringing home the pork. I am sure most politicians rationalize the dirty job of securing the money, populist pandering and pork-barrel rolling as a necessary pre-conditon ultimately getting around to doing what is right for the country. The obvious problem is that the continuous reelection inspired compromises do far more damage than whatever good comes later." I have a suggestion for you to increase traffic. It is time to start offering hats, t-shirts, jogging pants, coffee mugs, etc. with your blog name and logo on it.Then, Have someone like Scarlett Johansen wear your t-shirt on the Daily show. No charge for the advice. So much to chew on, so little room to reply. Without going into a TON of detail, there is no relationship between "all politics is local" and having a divided government. None. Although some people like to assert the Republicans have complete control right now ( "vote Democrat or don't vote" ), in reality they don't ( see the numerous filibuster threats and failed legislation ). So, the bottom line is the structure of our government makes it extremely difficult for one party to have absolute control. It's only happened one time in my lifetime, and that was with Jimmy Carter. I think the people that do vote remember that situation and have kept things sort of in check since. Case in point, Kentucky has a huge Democrat voter advantage, about 2 to 1. Yet, they are outnumbered 7 to 1 in representatives. Although people elect Democrats locally in HUGE numbers here, on the federal level they have gone Republican. They have somehow statewide divided their government. Now think about things here for one second. On the local level, the person they expect to bring home the bacon from the state capitol, they elect Democrats. On the national level, the people they expect to bring the bacon to Kentucky, ergo their home town, they elect "big spending Republicans". It's all local, and it's split the government here. The two issues are unrelated. My point on "all politics is local" was only that running a campaign purely on national issues will not generate the interest needed to beat an incumbant. That's all. It killed the Dems in 2004 when they SHOULD have taken control, and, we'll see what happens in 2006 soon enough. And, as soon as the Dems do regain the House and Senate, I do expect all of the blogs bitching about the current situation to continue that course. History has proven an ebb and flow of political control in the US, the Dems will get it back at some point once they quit shooting themselves in the foot and the majority Democrat voters don't feel compelled to vote for any party but their own. I'm just pointing the way for them. Quit harping on contrived and hard to understand national issues and address local issues and they'll win. It's that simple. Then you'll have start telling people to vote Republican to keep the government divided. You can't out wordify me on my own blog moon. Moon comments:"there is no relationship between "all politics is local" and having a divided government. None." I didn't say there was. I did say that I would like there to be. The link is purely aspirational. The notion (hope), is that the concept of Divided Government becomes popularized enough, that voters consciously decide that Divided Government is more important that local issues or their preference for an individual candidate. It's a way to "give permission" for fiscally conservative voters to vote for a Democrat in '06. And yes, I know it's a longshot. I was going to write an entire post on this subject, but it looks like I covered it here. Now I guess I'll have to write on something else. Moon comments:"Although some people like to assert the Republicans have complete control right now ... the bottom line is the structure of our government makes it extremely difficult for one party to have absolute control." True, with your inclusion of the words "complete" and "absolute". However, my observation is that a simple majority in both houses with a president of the same party is sufficient to create the kind of single party control problems outlined here. Complete or absolute control is not needed. This is documented historically in the Niskanen article linked in the sidebar. BTW - The benefit of Divided Government is only documented (and advocated here) in the context of the Federal Government. I have found no similar support for divided government at the state level. Might be true, might not, just don't know. Moon comments:"It's that simple. Then you'll have start telling people to vote Republican to keep the government divided." If the Republicans retain control of both houses, I will vote Dem for President in '08. If the Democrats take both houses, I will vote Republican for President in '08. If the Democrats take one house, and look like they will keep, there is no "Divided Government" vote, and I'll vote for Best Man/Woman for President in '08. Moon comments:"We'll address the other stuff later I suppose :)"
I'm with you. I have always been a loyal Republican, but not anymore. 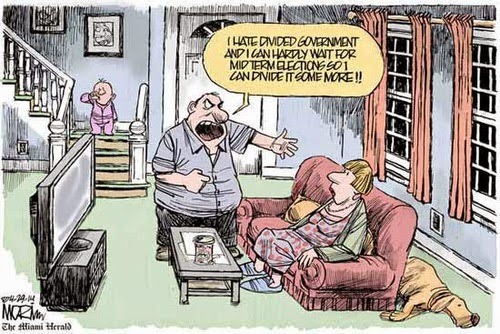 Divided govt. worked in the 90's and we need it now.